I haven’t talked about moving lately. Some of my seasoned readers know I’ve wanted to move home for a while and I’ve taken tiny steps towards that end. I rented a storage space, sifted through some of my belongings, and entered into thoughtful discussions about selling my condo, The Coop. When I got back from Maine last night, I decided to pick up the packing pace. Time to box up my Apocalypse Closet. I’ve hinted at my apocalyptic concerns before; some people call it “prepping” and since 2008, it’s morphed into a cottage industry all its own. There are blogs, websites, kits, and even Tee Vee shows which carefully explain how to store enough food and toilet paper to last through the Eschaton. I mean no disrespect to any of these experts; I’m sure they’re perfectly lovely people. I’ve learned many things from opening my mind to the notion that the years leading up to what was considered “normal retirement age” for my grandfather and father might be completely different for me. In fact, it’s quite possible that I won’t ever retire. Still, none of these Doomsday prophecies and predictions explains why I have 16 cans of tomato products in my Apocalypse Closet. Prepared Tomato Sauce (3 26 ounce cans). One can, which must have been slightly dented at the time of purchase, had dangerously expanded over time and did, indeed, explode when I took an investigative can opener to it. I also have four containers of frozen tomatoes from last year’s harvest, but that would be another blog post, Apocalypse Freezer. I packed all these cans into boxes and reusable shopping bags and I’ll move them to a new location. My Apocalypse Closet doesn’t have the same cachet it used to have for me because I don’t spend much energy “stocking up” on food anymore. I’ll create an Apocalypse Closet wherever I live. Maybe I’ll call it something different, like “the cupboard of ingredients for throwing together great meals when unexpected guests stop by.” My survival might depend more on my neighbors than my closet. Even though I don’t drink, I’ll keep a couple of jars of Spanish olives on hand to mix up a few martinis, in case James Bond speeds in, shaken or stirred. Do I have enough food to last 72 hours? Yes, of course. Do I have enough food to last until I’m 72? No, of course not. When I think about trying to stash away enough of any one thing to last a lifetime, it seems selfish and absurd. Sure, toilet paper bought three years ago is cheaper than toilet paper bought today and so an investment in toilet paper may have been a very good financial investment. But if and when the proverbial BLEEP hits the fan, I can only make an educated speculation on what items might be the most important things to have in my Apocalypse Closet. I just don’t see how it’s going to be canned tomato products. That was stinkin’ thinkin’ on my part. Don’t get me wrong; I’m not suggesting that everything is fine in the world and that the masters of the universe have come up with something to fix the things that are wrong. I’m not that naïve. 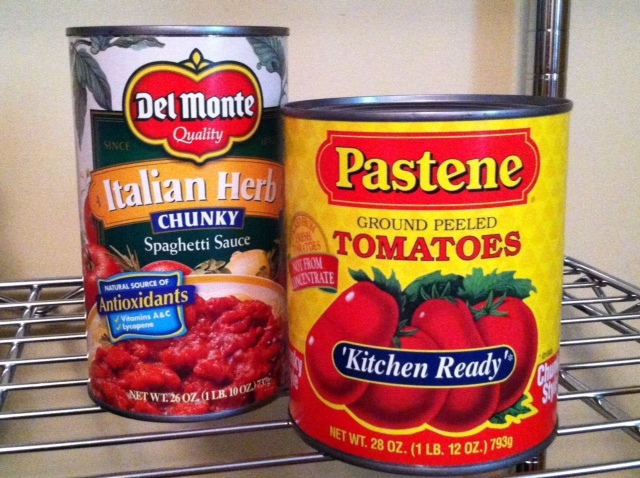 Grace and love, among the people I care for, is more valuable in tough times than sixteen cans of tomato products. I have a super easy recipe for homemade tomato soup from a book called Autumn from the Heart of the Home and maybe I’ll start having late Saturday lunches and serve soup with grilled cheese sandwiches and homemade brownies for dessert, just like the author, Susan Branch, recommends. I’m only a little bit more embarrassed to admit I’ve also got a whole lot of baking chocolate stashed away in that closet. This entry was posted in Experiments and Challenges and tagged Apocalypse, canned tomatoes, Eschaton, good neighbors, Prepping, Susan Branch. Bookmark the permalink. Maybe not Homeland Security, but I saw that opened can on the Emergency and Disaster Information Service (http://hisz.rsoe.hu/alertmap/index2.php). There was a HAZMAT team on the way.